Imagine this: it’s just you, your Porsche, a full tank of gas, and nothing but miles and miles (or kilometers and kilometers depending on where you are) of smooth tarmac. With plenty of twists and turns, straightaways and follow-throughs to put a smile on your face as wide as the rear end of your 911 Carrera, taking your Porsche out on a closed track circuit is practically a motorsport pilgrimage. Now, because HOUSE Automotive is located here in Southern California, we’re going to go out on a whim and assume that you’ve spent your fair share of time rotting your existence away in traffic on our network of overly complicated freeways. OK, maybe commuting isn’t all that bad, but our point is that you can’t really give it the beans (note: our independent Porsche repair shop does not condone reckless or dangerous driving) when you’re stuck in gridlock traffic all the time. For the sake of enjoying your Porsche as it was meant to be enjoyed, perhaps it would behoove you to visit a race track. It’s a shame we don’t have a list of them below…oh wait! 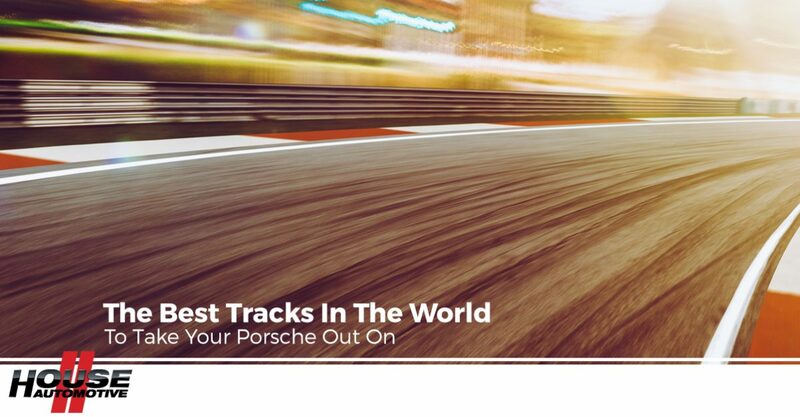 That’s right; below, our Pasadena Porsche repair experts are going to touch on some of the world’s most renowned tracks for you to really get the most out of driving your Porsche. If you have any questions about our services, feel free to contact us with any questions! Why not start out with arguably the greatest track in the world? Of course, that’s a subjective matter, but the Nurburgring is widely regarded by many as one of the ultimate tracks to drive on. Of course, we’re probably a bit biased because this track is in Germany, where our own automotive roots hail. With nearly 13 miles (roughly 21 kilometers) of perfectly-paved track and more than 150 corners to whip your Porsche through, this is a demanding but wildly fun and engaging course. Many tracks around the world are limited to private access, but depending on when you go, all you have to do is purchase a day ticket — then you’re good to drive! Located in Japan — the appropriate track for the Japanese Grand Prix — this sweeping circuit features a “figure 8” layout and a number of complex, challenging and rather technical corners. Suzuka has a ton of history behind it, which unfortunately includes the 1989 collision between legendary driver Ayrton Senna and Alain Prost at the course’s chicane. Still, all things considered, the Suzuka Circuit is as beautiful as it is demanding. Now here’s a track that you can actually drive to and access from Los Angeles! The Mazda Raceway Laguna Seca is located in central California in Monterey County, initially built in 1957. With just 11 turns throughout the course, don’t let that relatively small number confuse or fool you. Featuring the ever-challenging (and arguably terrifying) downhill-plunging “Corkscrew” at Turns 8 and 8A, drivers race down a hill where they’ll have to turn without knowing what’s below them at first. Only experienced drivers should attempt this course (and all of these racetracks, really). Spanish for “dry lagoon,” Laguna Seca’s track lies on what was once a lake and is now a dry lake bed. While the area is otherwise dry, two artificial ponds were added for what we assume to be aesthetic purposes. Widely regarded as the “home of British motorsport,” Silverstone is by far the most famous race track in the UK. As far as F1 racing goes, Silverstone’s corners are considered some of the very best. With a long and rich history serving motoring enthusiasts throughout the ages, Silverstone’s track has changed a great deal since the original layout. However, it still remains as one of the few “old-school” circuits as defined by racing authorities. If you’ve spent any amount of time watching the old BBC Top Gear, you’ve probably heard Clarkson, Hammond or May talk about (or race on) Silverstone. As what can only be described as the ultimate F1 racing destination in the world, this lavish city is home to the extremely curvy Monaco Grand Prix circuit course. As a true street circuit, you can drive on the same roads that professional F1 racers drive on, but you’ll have to navigate traffic, of course (again, HOUSE Automotive does not condone reckless or dangerous driving!). Visit Monaco for the culture, stellar weather, and excessive display of wealth, and stay for the F1 magic. If you’re a true gearhead, making it out to Indiana is a must — sure, maybe there aren’t too many reasons to go out and visit other than seeing Pawnee in person (any Parks and Rec fans out there? ), but the Indianapolis Motor Speedway is a true racing gem. As the second-oldest motor racing circuit on planet Earth (we can’t speak for Mars or long-forgotten Pluto), there’s some true gasoline-fueled history at this circuit. Originally constructed in 1909, the Indianapolis Motor Speedway actually celebrated the 100th Indy 500 motor race back in 2015. Sure, not every Porsche we work on is anything close to a 911 GT2 RS, but that doesn’t matter. Every make and model we encounter shares the Porsche racing pedigree, and that’s part of what excites our Los Angeles Porsche mechanics. If you’re in need of independent Porsche repair or independent Porsche service, contact us or schedule an appointment with HOUSE Automotive today!